"Jun's food is tasty, fresh, and authentic." "Each time he is there, guests ask for his card- he is that good!" "If you haven't had Jun into your house to do his magic, I encourage you to do so. I have had him in many times. He comes with everything he needs, prepares an amazing dinner which includes dishes with unbelievable tastes and smells. He responds to my guests' needs- mild please, no gluten please, please no fish. Each time he is there, guests ask for his card- he is that good! And to top it off, he leaves the kitchen clean. I wish Jun did all my parties because when he does, I am the hostest with the mostest!" "The dishes are incredibly tasty and will suit every palate. The price per person makes Lemongrass an economical alternative to cooking for your guests." "I have welcomed the services of Jun Pintana of Lemongrass Thai Food on many occasions, for groups ranging from seven to twenty-two guests. From the moment that Jun arrives at my home, I know I can relax and enjoy my guests….dinner is in good hands. The freshness and quality of food is always perfect. The dishes are incredibly tasty and will suit every palate. The price per person makes Lemongrass an economical alternative to cooking for your guests. Jun provides superior customer service – he arrives on time, is well prepared and always serves up his dishes with a big smile. Best of all, he will always remember my preferences (no coriander) as well as that for repeat guests (food allergies, vegan or vegetarian). Opening my front door for Jun is like welcoming an old friend into my home." "Everyone thought your food was "out of this world" and our waist-lines prove it!" 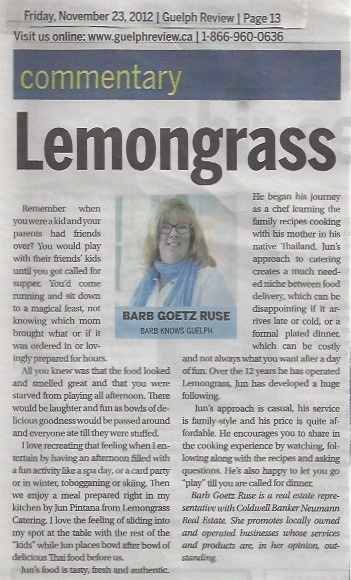 "I would like to thank you, once again, for the spectacular Thai dinner LemonGrass prepared for my family and friends. Everyone thought your food was "out of this world" and our waist-lines prove it! Many guests were appreciative of your cooking demonstration while preparing the meal and providing copies of your recipies was a nice touch. We're all hoping to give them a try. I would also like to thank you for helping to choose the menu items as well as your efficiency in set-up and tidying up after the meal. It was wonderful not to have to worry about those details while hosting the evening. As you know, I have also utilized your "Gift Certificates" for family, friends and clients for various occasions such as birthdays, house warmings and other celebrations. The feedback from the recipients has been wonderful. Everyone has commented on the uniqueness of having their "personal Thai chef" for the evening and the pleasures of eating your delicious meals." "WOW, we cannot thank you enough for the talent you brought to our wedding... your cooking!" "KUP KHUN MAK KRUP!!! WOW, we cannot thank you enough for the talent you brought to our wedding...your cooking! Our day was made up of friends that are so important to us and our family. We are so lucky to have you as a friend and for you to have provided such delicious foods on our wedding day." "Once you've had Jun cater a gathering, you'll never want have one without him again." "Once you've had Jun cater a gathering, you'll never want have one without him again. His food is top quality, sumptuous and plentiful. He works miracles in my tiny kitchen and is always professional, organized and cheerful. You may have guessed by now that I am Jun's number 1 fan!" "He makes entertaining an easy and super delicious affair." "It is a pleasure to have Jun in our kitchen. He makes entertaining an easy and super delicious affair. I can not recommend him more highly!"